The hotel industry lobby in Spain has made quite clear its opposition to the rise of the alternative holiday experiences through such platforms as Airbnb and its little brother Misterb&b. The majority of tourists being tired of high season prices for low quality experiences of 25sqm hotel bedrooms, have in turn taken advantage of either sharing a property with owners or renting an entire home during their stay in various destinations around the world – in Malaga this in no exception. I would agree that it is a much more authentic experience than staying in a hotel. I would also suggest that the hotel companies are very much aware of this and are looking closely as to how they can change course to redesign their current properties to satisfy this market trend or invest in holiday apartments. I also feel that this ‘trend’ will remain an integral part of the market demand. This year in Spain saw the implementation of a new law that defines private properties that are rented out to tourists termed as ‘Viviendas con fines turisticas’ – Dwellings for tourist use. This new law required the registering of such properties and in turn for each of these properties to satisfy a set of minimum standards – all of which seemed quite reasonable in order to ensure a good tourist experience. So if this new ‘product’ is here to stay then what interests me is the power of design to attract guests and enhance the local experience that they are looking for. Hotel design has been around for centuries as has the acceptance that the design that distinguishes each hotel in turn draws a certain type of clientele. Design is what ensures that the guest’s needs are taken care of. The sense of space, the sense of place, the quality of the materials, the storage, lighting, location all add to the tourist experience which in turn makes for a happy tourist – happy tourists write about their experiences and this is the best marketing tool available. This micro economic phenomenon is what makes for a healthy tourist economy. Good design does not need to cost the earth. But good design can help you distinguish your apartment, rural home, water tower dwelling, caravan or cave dwelling from the others and in turn allow you to either charge higher prices or ensure maximum occupation. 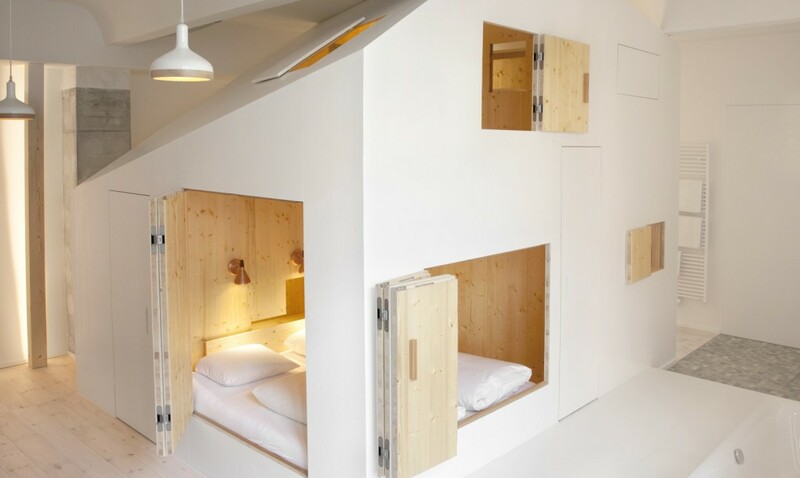 Photo Credit: Designer – Sigurd Larsen, Belins Hotel Michelberger.